This skate bag is constructed from Heavy Duty 600D PVC water resistant material with embroidered logos. Can carry skates up to size 40. The skate bag has an internal base board for structural strength, air cycle vents, plastic feet on the base and a shoulder carry strap. Very nice bag. My daughter loves it, especially since no one else in her class has this design and it is actually big enough to hold her coat. The bag is of good quality. I am very pleased with both the product and the service provided. Excellent quality and fantastic for keeping your skates and other items together and tidy! My daughter loves it and puts her skates away straight after use! Nice bag. Looks better in person than in photo. Black bag's colors and pink piping look good together. It is a tad smaller than I would have liked. Roller skates fit fine, but inline skates (Women's size US-7 (EU-40) did not fit. Otherwise, bag is of good quality. Has good sized pocket on back of bag with zipper. Holds cell phone, small purse or wallet, keys, etc. easily. 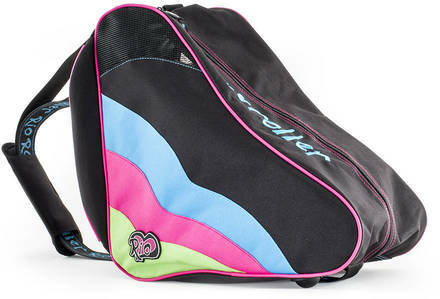 The Rio bag fits the Rio skates perfectly and is a great and easy way to travel to the rink with her skates! Great bag - skates fit in well and the colors are nice.